Any old timers here running PT Version 8 HD3 ? I have 2 96io w/ 2 AVID PRES feeding the analogue and 2 x 8 pres connected with ADAT(optical) to each 96io. I have 1 core card, 2 process and 3 accel cards in a Magma expansion chassis. The 96ios are connected w/expansion to primary ports.Checked hardware settings and selected "optical", selected the digital inputs A9-A16 and B25-B32 ... What am i doing wrong. Is it possible to have 32 inputs with 2 96ios and 2 optical in preamps? Thanks for your feedback .... I'm having serious bran farts. It's hard to understand exactly what you've done but I have an idea where you've gone wrong. 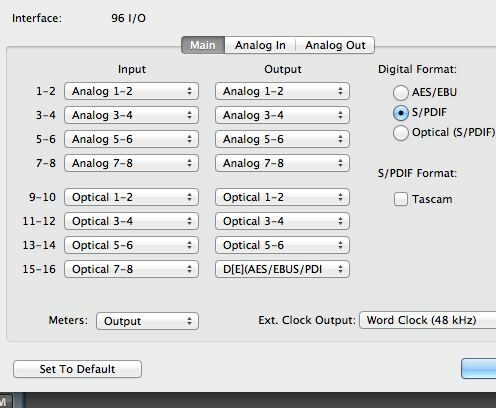 Post a screenshot of the hardware setup page for each Digi96. Just the first "tab". Also, what are the pres that are hooked to the Digi96 via ADAT? Avid Pres have no optical connection which is why I asked. They are strictly analogue devices, in fact. Aha!! Never used those either so good catch. Edit: he says he has 2 more preamps connected via optical so my guess is he uses the Avid pres for analog and another pair of 8 pres that has opticalz sorry if I confused you here. I read it like he had the Avid pres only. PT10.3.10 Mountain Lion HD6 accel Magma PE6R4 Control 24 MacPro 12 Core 3.46ghz UAD-2 Octo x2. Manley Vari-Mu, Manley Massive Passive, SSL VHD, ADL600, Grove Tubes ViPre, Tube-Tech CL-1B. Hafler TRM active monitoring. Thanks guys .... this is one of those cases where I don't mind feeling like an idiot. In the end it was the hardware section and I had selected (optical)spdif because I didn't see ADAT anywhere ... which of course disabled the "optical" option in the hardware selection. Total newb gaff. All is good and up and running 32 inputs woohoo. You have all been very helpful and your feedback is very much appreciated.